He-Man is weird. For a property that used to be based on making whatever is popular RIGHT NOW (Barbarians! Space aliens! Cowboys! Ninjas! ), it sure got stuck in one particular part of the ’80s. Even the attempt to “modernize” it with space-age aesthetics failed (though now people look fondly on The New Adventures of He-Man). The new toyline straddles an odd line of slavishly reproducing people’s childhood memories while trying, trying to introduce something fresh. New, original figures like Draego-Man, The Unnamed One, or today’s toy have met mixed results – Draego-Man was an unqualified success, whereas people are still stabbing one another over Unnamed One. And then we’ve got his gal! See, He-Man got a space-age redesign in the New Adventures, and so the Classics line has made a New Adventures version of She-Ra. She’s a new character, but she builds on an existing design, and she also made a really brief appearance in a comic back in March 2014. So, now that we have this figure… well, how is it? After years of fighting the Space Mutants and Horde Empire, the Protectors drew a truce with Skeletor to stop Horde Prime once and for all. After He-Man and Skeletor were blasted by prime’s vortex beam, She-Ra was left alone against his might. Calling upon the Honor of Grayskull, She-Ra sapped magiks from Prime’s armor, ending the spell that prolonged his and all Horde members extended lifespans. In an exception to her policy to protect all life, Adora smote Prime’s body against his own throne, forever ending the threat of the Horde Empire! but in doing so, Prime’s evil soul lashed out at her, binding itself to her armor. Overwhelmed by darkness, She-Ra once again became Despara, the evil warrior-queen persona she originally created under Shadow Weaver’s spells. Unleashed again, Despara resurrected Skeletor and helped bring about the Fall of Eternia! 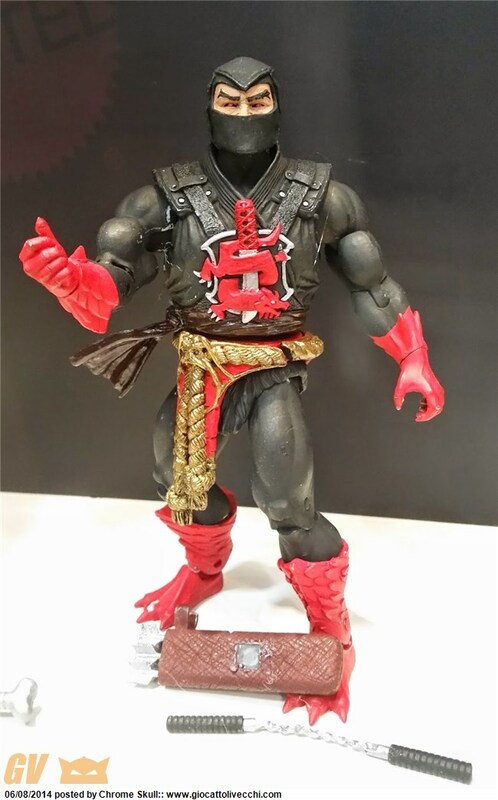 This is the same as every MOTUC figure. It’s fine. I am tired of describing this. When I first saw this cosume design in the mini-comic, I immediately fell in love with it. This version of She-Ra is like a space-age valkyrie, and she just looks awesome… so perhaps I am biased. Her color scheme is primarily white, silver, and blue, contrasting with Galacti Protector He-Man’s white, gold, and blue. She has a new breastplate/bodice design which is reminiscent of the vintage Starburst She-Ra figure while not being an exact copy – the feather pattern gives her kind of a swan/angelic look. She-Ra’s helmet is more techno-themed than her other headdresses, but has wings on th side which gain reinforce the valkyrie look. It has a removable green visor, which actually does transition her to a less techno-theme when removed. And, interestingly enough, her cape connects directly around her neck by means of a detatched collar. While this makes She-Ra quite vulnerable to strangulation in ways that a shoulder-connected cape would not, it does look pretty good on her. As long as it doesn’t get caught in anything and choke her to death. She-Ra has only two flaws in her sculpt that I found. Her arms look odd with the articulation – this isn’t as much of an issue with male figures because their exagerrated musculature produces curves that can hide joints, but women like She-Ra have a smoother shape to their arms, and thus it comes off looking more like a toy or a doll than other figures. And no, I’m not saying that women are weak, it’s a body type thing. Her shoulders look odd and unnatural, especially when compared to the rest of her – but this is just the way it is, and she’s hardly the first one to have that problem. The other is in her helmet and visor – as fantastic as they may look, the helmet is just SLIGHTLY off-center, and thus so are the goggles. Every single She-Ra I’ve seen shares this problem, so it’s not avoidable. And when you see it, you can’t unsee it. Those two things are the only flaws, though. As I said, Galactic Protector She-Ra’s color scheme is mostly white and silver, with some blue and green added. The blue pants match up with He-Man’s, iving some continuity there, as does the green of her sword and shield. And visor, too – she’s he silver to her brother’s gold, though clearly not their inferior (come on. She killed Horde Prime). She-Ra’s outfit is pretty complex, and thankfully lacks paint slop – the paint apps are smooth on the little jewels (lights? buttons? on her helmet, or the designs on her loincloth. The detail isn’t overdone, but remains at a level where Mattel can comfortably perform. Overall, the effect is what I said before – kind of a space-age techno-valkyrie. Her paint is clean and crisp, and her color scheme compliments Galactic Protector He-Man… though I don’t have one of those for comparison. Galactic Protector She-Ra has typical female MOTUC articulation – a ball-jointed head, ball-and-socket shoulders and hips, hinged elbows, knees, and ankles, and swivel biceps, wrists, thighs, and waist. She is one of the few female MOTUC figures whose long hair does not mess up her head movement. It’s awesome! She-Ra can actually look around like a normal human being! Galactic Protector She-Ra does have one articulation flaw, though – her ankles are loose. Or at least mine are. This may make her really unsteady while stamding, though only time will tell for sure. She-Ra’s Power Sword has changed with the times, just like He-Man’s – it has become a lightsaber! Well sorta. I think the blade is a laser, or maybe it just covers itself with lasers since she can sheathe it in a little holster on her cape. There’s no denying that it looks awesome, though, whether in hand or fastened to her cape. This is the weapon that killed Horde Prime, and it’s an awesome combination of sci-fi and fantasy right there! In keeping with her laser sword, She-Ra has a laser shield. The design is very complex, looking like an eagle crest – or maybe another Valkyrie thing. it clamps easily on her wrist, and just looks awesome! Strangely, the shield seems to be made of lasers, but I don’t see any actual physical device for her to hold. Perhaps it projects from her gauntlet, or perhaps it’s something else. Curiouser and Curioser! And finally, she’s got a surprise gun! It isn’t really listed or featured anywhere, and it’s stored in her holster rather than in the plasti tray, so it’s a great little bonus. She-Ra’s laser pistol is a complex little Buck Rogers weapon, and definitely shows her practical nature. Yes, she mostly fights with a sword and shield, but she will shoot you if she has to. It fits easily in the little holster on her hip, too. At the normal price, you will end up paying nearly $40 once shipping and tax are factored in. I have never been a fan of this. Galactic Protector She-Ra is a pretty sturdy figure, but if the loose ankles on mine are not a rare issue, then it’s something to watch out for, as it can affect the figure’s stability. You want to buy her from Mattel’s site? Hahahahahaha! Just search around the net until you find a deal. Galactic Protector She-Ra’s overall look is like a space-age techno-valkyrie, and I love it. Looking like this, she could fit in the Marvel universe just as easily as the world of He-Man, but certainly does not look out of placein this new line. Technically she’s a new character despite taking cues from the Starburst figure, but the toy looks good enough to overcome that hurdle of not being a pure vintage translation. Her overall reception ha been interesting – negative before she came out, positive after the fact – but having this figure in-hand has definitely convinced me that it’s one of the best females in the line!